Posted by Dan Hauser on Monday, April 15th, 2019 at 11:55am. The "new" Tiger Woods was more of an elder statesman than a cutthroat competitor. The same guy who used to say that he would only tee it up if he thought he had a chance to win was now teeing it up in hopes of just getting four rounds in with his back staying in one piece. Sure, there were times where we saw flashes of the "old" Tiger in 2018. There was the PGA Championship where he finished runner up and almost ran down Brooks Koepka. There was Tampa where he had a putt on the 72nd hole that might have gotten him into a playoff. He even won the Tour Championship. When Tiger won the Tour Championship last season, everyone proclaimed the comeback was complete. He showed the world, and himself, that he could win again. He showed everyone, and himself, that he could compete with this new batch of hot young Tour pros and there 350 yard drives off every tee. There was one thing that everyone wanted to know though. Could Tiger Woods ever win another major? 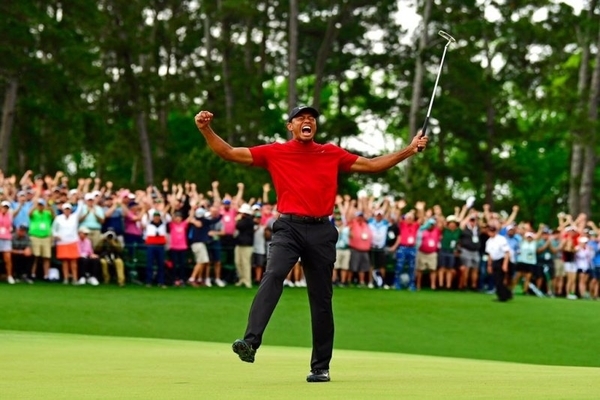 We got that answer and more this past week as Tiger Woods not only won his fifth Green Jacket, he came from behind to do it for the first time in his illustrious career. As everyone around him was imploding and hitting their balls into Rae's Creek, Tiger was completly unphased. The concentration and killer mentality that we saw on Tiger's face every week for a decade was suddenly back. Donning the same red mock turtleneck Nike shirt and black pants that he wore the last time he won at Augusta in 2005, it felt like we were all taken back in a time machine. Club twirls off tees, walking after his shot before it hit full apex, walking in birdie bombs, fist pumps, we were reminded of the days of Tiger showing up on the first tee box and mentally defeating everyone before anyone even hit a shot. In 1997, when Tiger won his first Green Jacket, he was immediately greeted by his father and mother as he walked off the 18th tee. He gave his dad a giant bear hug, having no idea the career that would be ahead of him. He walked off that same 18th green yesterday a completely different man. His mom was there, just like she was in 1997 but his dad, who died in 2006 wasn't. In his place though were his two children, Sam (12) and Charlie (10). Sam and Charlie had never gotten to see their dad win a major. 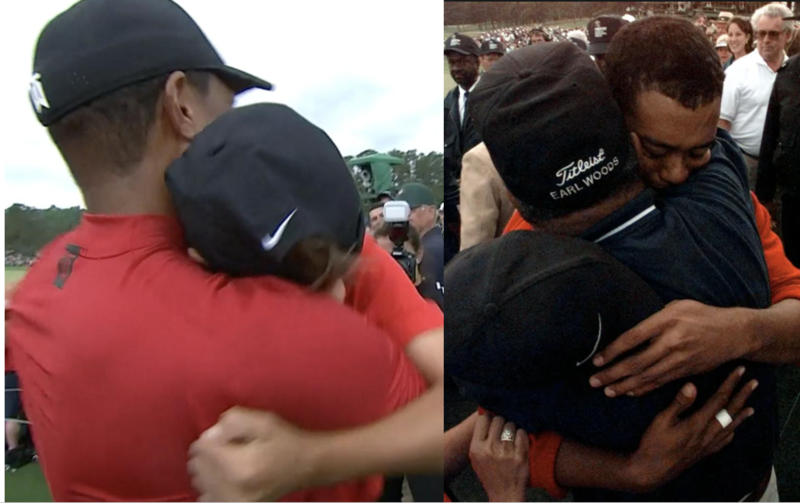 They had heard all the stories about how dominant their dad once was but never actually got to see it happen up close (the last time Tiger had won a major, the U.S. Open on a broken leg in 2008, Sam was an infant and Charlie wasn't even born). Not anymore though. They got to enjoy what it was like to watch their dad dominate again just like the rest of us did. They got to witness the man that we all came to know as just "Tiger" be Tiger on the course once again on the biggest stage in golf. They said he was done. They said he wouldn't win another major. In 2017, he thought he would never play golf again. Yesterday, Tiger Woods not only showed that not only is he not done, but he's not going anywhere anytime soon.